Citation: Shaukat A, Almaslamani M, Al-soub H, et al. Pseudomonas aeruginosa bacteremia in ICU; clinical presentation and outcome, emergence of MDR strains. J Infectious Disease Med Microbiol. 2018;2(1):3-7. P. aeruginosa is an aerobic gram-negative rod, belongs to the family Pseudomonadaceae, widespread in nature (soil, water, plants, animals, humans) and has a predilection for moist environments [1,2]. It is a non-fastidious, motile organism that grows on blood and MacConkey agars. Pseudomonas aeruginosa has emerged as the most common gram-negative pathogen associated with serious hospitalacquired infections, particularly within intensive care units [3,4]. Because of their ubiquitous nature and ability to colonize and survive in hospital reservoirs, they tend to cause infections in immunocompromised and critically ill patients . P. aeruginosa bloodstream infections has high mortality greater than 20% in many studies and is highest among patients receiving inappropriate initial antimicrobial treatment [6,7,8]. It can cause widespread infections. PsA bacteremia may be primary (with no identifiable source) or secondary to a discrete focus of infection, including: urinary and GI tract, lungs, skin and soft tissue, intravascular foci (e.g., indwelling central venous catheters) . Pseudomonas aeruginosa is intrinsically resistant to many antibiotics and has ability to acquire resistance to any antibiotic [9,10]. Antipseudomonal antibiotics include some β-lactams, such as ceftazidime, cefepime, tazocin, meropenem and imipenem. Among other classes Aminoglycosides, such as amikacin and gentamicin, fluoroquinolones such as ciprofloxacin and fluoroquinolones and miscellaneous like colistin are active against this bacteria. However, over past few years several strains of P. aeruginosa resistant to these antibiotics have emerged and are becoming widespread [11,12]. Emergence of multidrug resistant strains of Pseudomonas aeruginosa is a signifinant problem in health care settings [13,14]. An estimated 51,000 healthcare-associated Pseudomonas aeruginosa infections occur in the United States each year. More than 6,000 (or 13%) of these are multidrug-resistant, with roughly 400 deaths per year attributed to these infections . Emergence of Pseudomonas MDR strains is a challenge faced by ICU physicians. This study will help us to estimate incidence of Pseudomonas MDR strains in ICUs in Qatar. We also assessed risk factors associated with emergence of resistant strains, mortality and poor outcome. Pseudomonas bacteremia: Pseudomonas bacteremia is defined as identification of Pseudomonas aeruginosa in the blood culture . Septic shock: Septic shock is defined as sepsis associated with organ hypoperfusion and either a systolic blood pressure of less than 90 mmHg or less than 30 mmHg below the baseline requirement of vasopressors to maintain blood pressure. Multidrug-resistant: Multidrug-resistant isolate is nonsusceptible to at least one agent in three or more antibiotic classes . Extensively drug-resistant: Extensively drug-resistant isolate is non-susceptible to at least one agent in all but two or fewer antibiotic classes . Pandrug-resistant: Pandrug-resistant isolate is non-susceptible to all antimicrobial agents . Effective initial antimicrobial therapy: Effective initial antimicrobial therapy was defined as antipseudomonal antimicrobial administered within 24 h after clinical suspicion of sepsis or infection that was later found to be susceptible to blood isolates of P. aeruginosa. Delay in effective antimicrobial therapy: Delay in effective antimicrobial therapy was defined as more than 24 h delay in the administration of empirical antibiotics effective against P. aeruginosa isolate prior to the availability of the results of antibiotic susceptibility testing. It’s a descriptive retrospective study where demographic and clinical information was collected from patient’s files retrospectively. Pseudomonas isolates collected over the period (2009-12) from all positive blood cultures from patients in 3 ICUs (MICU, SICU, TICU) Hamad General Hospital preserved in Microbiology lab (47 specimens) (Table 1). These strains were revived (subcultured) and sent to Canisius-Wilhelmina Ziekenhuis (CWZ), Nijmegan, Netherlands for genotyping. Table 1. Demographic and clinical characteristics of patients with Pseudomonas aeruginosa bacteremia..
Genomic DNA extraction was carried out on a MagNA Pure LC platform by using the MP LC DNA isolation kit III for bacteria (Roche Diagnostics, Almere, The Netherlands). AFLP fingerprinting was performed using the combination of restriction enzymes HpyCH4IV and MseI with minor changes . PCR amplification involved HpyCH4IV and MseI primers that contained a C and GG residue respectively, as selective nucleotide(s). The HpyCH4IV primer was labeled with 6-carboxy-fluorescein. Amplified fragments were separated on a MegaBACE 500 automated DNA analysis platform. Fingerprint data were imported into BioNumerics v6.0 software (Applied Maths, Sint-Martens-Latem, Belgium) and analyzed using the unweighted pair group method with arithmetic mean (UPGMA) clustering in combination with Pearson’s correlation coefficient. Study group comprised of 47 patients, 19 from medical ICU, 17 from surgical ICU and 11 from trauma ICU. Majority were males with male to female ratio 2:1. All age groups were involved with mean age 54 ± 2. Baseline comorbidities were present in 37 out of 47 patients (78%). Comorbidities were mainly diabetes mellitus, history of cerebrovascular accident, chronic liver disease, malignancy, severe head injury /subarachnoid hemorrhage. Half of cases presented with septic shock, 24/47 (51%). Mean ICU stay was 55 days. Infectious disease consultation was done for 32 out of 47 patients (68%). Appropriate empirical antipseudomonal antibiotics was started in 42/47 (89%) of patients and antibiotic therapy was tailored according to susceptibility results later. Mean antibiotic duration was 11 days (as some patients died before completion of treatment). Empirical dual antipseudomonal coverage was used in 16/47 patients (34%) mainly in cases where Pseudomonas MDR was suspected. Source of bacteremia was central line related bloodstream infection in 20/47 patients (42%), 8/47 had VAP (17%), 4 /47 UTI (8.5%), 3/47 skin and soft tissue infections (6.3%), 1/47 cholangitis (2.1%), 11/47 bacteremia of unknown origin (23%). 29/47 patients died (61%), 12/47 (25% ) patients were sent to rehabilitation units or their home country, 6/47 (12.7%) were discharged home. Antimicrobial susceptibility showed 14 out of 47 patients (29.7%) grew MDR Pseudomonas. 4/47 (8.5%) were pan resistant, sensitive only to colistin. Colistin was 100% sensitive among all the isolates. Other susceptibilities were amikacin 92%, cefepime 82%, ceftazidime 82%, aztreonam 57%, ciprofloxacin 88%, gentamicin 86%, meropenem 78% and piperacillin tazobactam 86%. The genotypic relatedness among all isolates was determined by AFLP fingerprinting (Fig.1). There is no genotypic similarity amongst these Pseudomonas strains except 1612222689, 1611203857 and 1612224299 are probably related (in general they have the same pattern but some fragments are not shared by one or two of the other isolates). There was no cross transmission among patients isolated. Figure 1: Pseudomonas antimicrobial susceptibility graph. This study showed all cause mortality of Pseudomonas bacteremia around 60%, mainly because of primary disease. Out of those only 17% patient died primarily due to pseudomonal infection (Fig. 2). Our patient population had high index of comorbid conditions that led them more prone to develop superimposed infections. Almost all patients had received broad spectrum antibiotics in preceeding 30 days. This fact denotes that use of broad spectrum antibiotics is associated with emergence of resistant strains of Pseudomonas due to collateral damage . Dual antipseudomonal antibiotics were given in 34% of the patients. Majority of those patients were infected with Pseudomonas MDR strain and dual therapy was used to combat resistance. In our opinion, dual antipseudomonal coverage is warranted only in cases of Pseudomonas MDR strains where synergistic antibiotics are needed for optimum results. Adequate empirical antibiotic therapy initiation in suspected cases of sepsis and pseudomonal infections in critically ill patients is necessary as delay in the initiation can lead to increased hospital mortality [14,18]. Kang et al in his study reported that delay in starting effective empirical antimicrobial treatment was associated with poor prognosis in cases of Pseudomonas aeruginosa bacteremia . Regina et al found that appropriate empirical antibiotic in case of Pseudomonas aeruginosa bacteremia lead to decreased length of stay in hospital . In our series majority of the patients (89% ) were started on adequate empirical antipseudomonal treatment that reflects timely diagnosis and identification of patients at risk of having pseudomonal infections. However, it is equally important not to over treat and misuse broad-spectrum antibiotics in view of emerging resistance especially for gram-negative bacteria. Complying with international and local antimicrobial prescribing policy and local antibiogram while prescribing antibiotics based upon clinical judgment and timely modification or de-escalation of antibiotic according to antimicrobial susceptibility pattern of specimen is of utmost importance. We observed involvement of infectious disease team in 68% of patients to aid in selection of appropriate effective antimicrobial treatment and follow-up. It reflects the need of expert opinion in high-risk patients. Previous studies have shown that early involvement of infectious disease service lead to better selection of empirical treatment and lesser complications in those patients . Multidrug resistance acquisition by Pseudomonas aeruginosa is trending upwards worldwide and these isolates are genetically diverse [10,21,22]. Pseudomonas aeruginosa acquires resistance through several mechanisms including production of beta-lactamases, efflux pumps and outer membrane/target site modifications [4,23]. Multidrug organism may use combination of different mechanisms or one single but potent resistance mechanism [9,24,21]. Significant risk factors leading to poor prognosis in pseudomonal bacteremia were mechanical ventilation, central venous cannulation, presence of septic shock, multiple comorbidities and prolonged hospital stay, as reported in previous studies [2,25,26]. In our series all cause mortality was 61% (29 out of 47 patients) that is comparable with other studies. Vitkauskienė et al reported in his series overall mortality rate 58.8%. Our patient population had multiple comorbid conditions namely respiratory failure, polytrauma, head injury, burns, hepatic failure and chronic kidney disease, that contributed to poor outcome. Prolonged hospital stay, presence of comorbid conditions, septic shock, immunosuppresive conditions & H/O invasive procedures are poor prognostic factors in cases of pseudomonal bacteremia. Previous history of antibiotic use lead to emergence of multidrug resistant strains. Initiation of effective empirical antimicrobial therapy in patients at high risk of acquiring Pseudomonas infection can improve outcome. Tacconelli E, Tumbarello M, Bertagnolio S, et al. Multidrug-Resistant Pseudomonas aeruginosa Bloodstream Infections: Analysis of Trends in Prevalence and Epidemiology. Emerg Infect Dis. 2002;8(2):220-21. Vidal F, Mensa J, Almela M, et al. Epidemiology and outcome of Pseudomonas aeruginosa bacteremia, with special emphasis on the influence of antibiotic treatment: analysis of 189 episodes. Arch Intern Med. 1996;156(18):2121-26. Micek ST, Lloyd AE, Ritchie DJ, et al. Pseudomonas aeruginosa bloodstream infection: importance of appropriate initial antimicrobial treatment. Antimicrob Agents Chemother. 2005;49(4):1306-11. Rossolini GM, Mantengoli E. Treatment and control of severe infections caused by multiresistant Pseudomonas aeruginosa. Clin Microbiol Infect. 2005;11(4):17-32. Chamot E, El Amari EB, Rohner P et al. Effectiveness of combination antimicrobial therapy for Pseudomonas aeruginosa bacteremia. Antimicrob. Agents Chemother. 2003;47(9):2756-64. Hsueh PR, Teng LJ, Yang PC, et al. Persistence of a multidrug-resistant Pseudomonas aeruginosa clone in an intensive care burn unit. J Clin Microbiol. 1998;36(5):1347-51. Richard P, Le Floch R, Chamoux C, et al. Pseudomonas aeruginosa outbreak in a burn unit: role of antimicrobials in the multiply resistant strains. J Infect Dis. 1994;170(2):377-83. Verweij PE, Bijl D, Melchere WJ, et al. Pseudo-outbreak of multiresistant Pseudomonas aeruginosa in a hematology unit. Infect Control Hosp Epidemiol. 1997;18(2):128-31. Zavascki AP, Carvalhaes CG, Picão RC, et al. Multidrug-resistant Pseudomonas aeruginosa and Acinetobacter baumannii: resistance mechanisms and implications for therapy. Expert Rev Anti Infect Ther. 2010;8(1):71-93. Livermore DM. Multiple mechanisms of antimicrobial resistance in Pseudomonas aeruginosa: our worst nightmare? Clin Infect Dis. 2002;34(5):634-40. Chatzinikolaou I, Abi-Said D, Bodey GP, et al. Recent experience with Pseudomonas aeruginosa in patients with cancer: retrospective analysis of 245 episodes. Arch Intern Med. 2000;160(4):501-9. Harbarth S, Ferriere K, Hugonnet S, et al. Epidemiology and prognostic determinants of bloodstream infections in surgical intensive care. Arch Surg. 2002;137(12):1353-59. 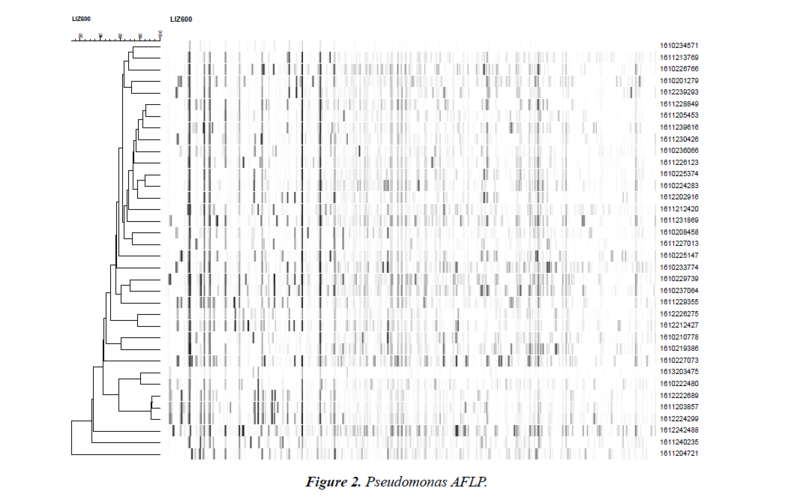 Bodey GP, Jadeja L, Elting L. Pseudomonas bacteremia: retrospective analysis of 410 episodes. Arch Intern Med. 1985;145(9):1621-29. Kang CI, Kim SH, Kim HB, et al. Pseudomonas aeruginosa bacteremia: risk factors for mortality and influence of delayed receipt of effective antimicrobial therapy on clinical outcome. Clin Infect Dis 2003;37(6):745-51. Center for disease control and prevention. Antibiotic resistance threats in the United States. 2013. Magiorakos AP, Srinivasan A, Carey RB, et al. Multidrug-resistant, extensively drug-resistant and pandrug-resistant bacteria: an international expert proposal for interim standard definitions for acquired resistance. Clin Microbiol Infect 2012;18(3):268-81.
de Valk HA, Meis JF, de Pauw BE et al. Comparison of Two Highly Discriminatory Molecular Fingerprinting Assays for Analysis of Multiple Aspergillus fumigatus Isolates from Patients with Invasive Aspergillosis. J. Clin. Microbiol. 2007;45(5):1415-1419. Ibrahim EH, Sherman G, Ward S, et al. The influence of inadequate antimicrobial treatment of bloodstream infections on patient outcomes in the ICU setting. Chest. 2000;118(1):146-55. Osih RB, McGregor JC, Rich SE, et al. Impact of empiric antibiotic therapy on outcomes in patients with Pseudomonas aeruginosa bacteremia. Antimicrob Agents Chemother. 2007;51(3):839-44. Fluckiger U, Zimmerli W, Sax H, et al. Clinical impact of an infectious disease service on the management of bloodstream infection. Eur J Clin Microbiol Infect Dis. 2000;19(7):493-500. Tavajjohi Z, Moniri R. Detection of ESBLs and MDR in Pseudomonas aeruginosa in a tertiary-care teaching hospital. Iranian Journal of Clinical Infectious Diseases. 2011;6(1):18-23. Lim KT, Yasin RM, Yeo CC, et al. Genetic fingerprinting and antimicrobial susceptibility profiles of Pseudomonas aeruginosa hospital isolates in Malaysia. J Microbial Immunol Infect. 2009;42(3):197-209. Bonomo RA, Szabo D. Mechanisms of multidrug resistance in Acinetobacter species and Pseudomonas aeruginosa. Clin Infect Dis. 2006;43(2):S49-56. Poirel L, Naas T, Nicolas D, et al. Characterization of VIM-2, a carbapenem-hydrolyzing metallo-β-lactamase and its plasmid- and integron-borne gene from a Pseudomonas aeruginosa clinical isolate in France. Antimicrob Agents Chemother. 2000;44(4):891-97. Lodise TP, Patel N, Kwa A, et al. Predictors of 30-Day Mortality among Patients with Pseudomonas aeruginosa Bloodstream Infections: impact of delayed appropriate antibiotic selection. Antimicrob Agents Chemother. 2007;51(10):3510-15. Vitkauskienė A, Skrodenienė E, Dambrauskienė A, et al. Pseudomonas aeruginosa bacteremia: resistance to antibiotics, risk factors, and patient mortality. Medicina (Kaunas). 2010;46(7):490-95.